The sighting of a shark is usually enough to send folks fleeing to dry land. But when marine life specialists in Australia heard that one such animal was in need of help, their response was to jump in after it. Yesterday, a recreational diver contacted the staff at the Manly Sea Life Sanctuary to report that he had seen a juvenile grey nurse shark with an elastic fishing band wrapped tightly around its neck in the waters off Magic Point, near Sydney. A rescue team was quickly assembled from the sanctuary's expert staff, aquarists at the nearby SEA LIFE aquarium, and veterinarian Rob Jones from the Department of Primary Fisheries. 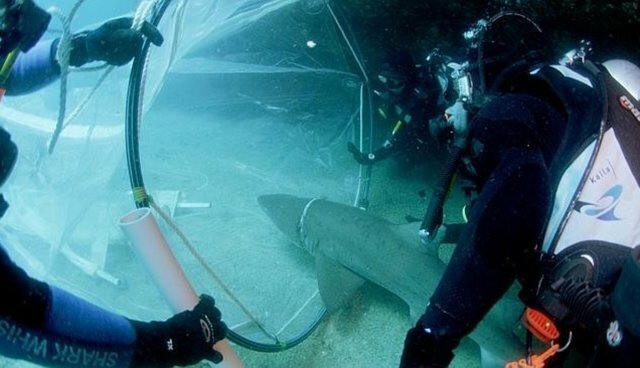 Well aware that a rescue mission could be dangerous, the crew moved ahead to save the distressed shark from what they say was "certain death." And fortunately, their efforts paid off. "A suitable vessel was secured for the operation and soon after arriving in the area the rescue team located the shark at depth and encouraged it into a special plastic 'sock,' from where they were able to raise the animal to the surface where Dr. Jones was able to remove the rope and administer antibiotics," the sanctuary writes. "The animal was then released back into the ocean with a vastly increased chance of survival." Grey nurse sharks are a critically endangered species, with a dwindling population in those waters -- meaning that the successful rescue operation not only saved one animal's life, it was of benefit to the entire species there as well. But sadly, not everyone behaves with the well-being of marine life in mind. 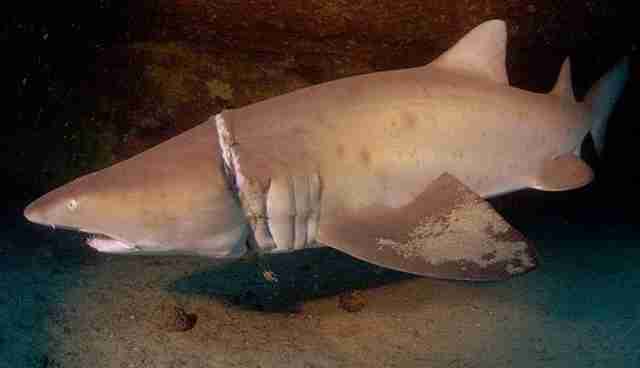 "There is believed to be around 1,500 Grey Nurse Sharks left on the east coast of Australia," said Dr. Jones. "So it is obviously frustrating to see a beautiful animal like this caught up in rope as a direct result of human carelessness."